A high ropes course from German manufactuer Kristall Turm is to be installed in Skegness, UK which is due to become one of the highest in the country. The 21m high structure, named Altitiue44 will have a seaside theme and be located near the Skegness outdoor pool off the Grand Parade in the town and is a joint project between East Lindsey District Council and Magna Vitae Trust for Leisure and Culture. 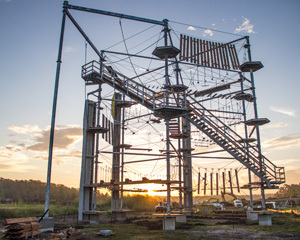 Image: A similar Kristall Turm high ropes course.